This week is going to be great! We have a wonderful list of products and recipes on tap for this week. Have fun with your new items, and if you have a recipe to share, please tell us about it! 6. Strawberry Cream Cheese and just Strawberries for our vegan members. Baby turnips and baby carrots make this presentation beautiful. Use at least 1 pound of each and instead of cutting them into matchsticks, simply peel the baby turnips and quarter them and then peel the baby carrots, leaving about 1 inch of greens and cut them in half, lengthwise. Proceed with the recipe as follows. Heat oil in a skillet and add turnips and carrots. Sprinkle with sugar and lightly brown in the skillet. Add the vinegar and reduce to a glaze. Season the vegetables with salt and pepper. Reduce the heat, add the water or broth and simmer, partially covered, until just tender, about 4 to 6 minutes. If any juices remain, remove the cover, raise the heat to high and cook quickly to reduce the juices to a glaze. Serve hot, sprinkled with minced dill and a good grinding of black pepper. If you have been tossing the tops in the compost, please read this. 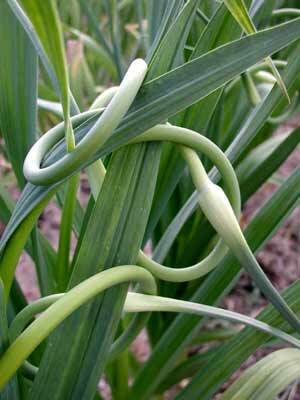 The bulb at the top of the plant is a very tasty tender part of garlic that can be used just like garlic. Simply peel the skin and pop the little garlic seeds into your favorite dish that call for garlic. You will be surprised at the flavor you get from this delicacy! Peel beets and bananas, and remove tops of strawberries. Combine all ingredients in a blender for the most amazing and refreshing smoothie ever! Heat oil and cook leeks, chilli and garlic, stirring until soft. Add stock and lentils. Bring to the boil, then simmer until lentils are soft, approximately 30 minutes. Top up with more stock if needed. Add spinach, and cook until spinach is soft. Season to taste. Serve soup into bowls, add a squeeze of lemon and a little extra virgin olive oil. Serve with crusty bread. Finding red lentils was nearly impossible in Cumberland, you guys may need to resort to green lentils, but in Bedford, Wholesome Living offers a fine selection of legumes and grains, including red lentils! Thanks for the shout out, Dawn! We try to keep a good selection of dry goods in stock. We also carry Pacific organic broths – great for recipes like this soup and others. Thanks for the recipes, they all sound delicious.